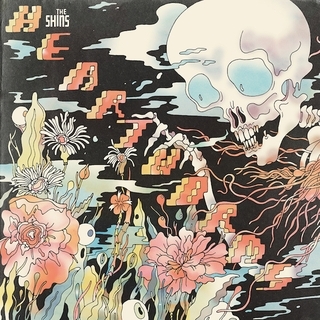 Since their breakthrough over 15 years ago, The Shins have made winsome indie pop that helped set the template for the next generation of bands. How many indie singers' vocals are indebted to James Mercer's style? How many strummy guitars and off-kilter keyboards have adorned young bands' songs? Mercer is the only main member of the group at this point, and when we last heard from him, was part of his side project Broken Bells with Danger Mouse. He's back to his original gig as Heartworms is the first Shins album in five years. Heartworms kicks off with the jaunty, hooky girl-power single "Name for You," written for Mercer's daughters. Try to get that super-catchy chorus full of "ba, ba-ba-ba" backing vocals out of your head for the next week. Next up is the ominous and disorienting "Painting a Hole" where Mercer sings of "elegant hands unemployed / or on a permanent holiday." The autobiographical "Mildenhall" is a high point of the album. The track rolls along with a dusty, Old West vibe as Mercer tells tales from his youth of learning to play his Dad's guitar and a classmate introducing him to The Jesus and Mary Chain. Singing in his lowest register, "Mildenhall" further stands out by being far more intimate compared to the piles of synth-y sounds surrounding it on the record. Lead single "Dead Alive" sounds like a classic, inviting Shins track while the shiny "Half a Million" is driven by '80s-sounding keyboards. If "So Now What" sounds familiar, it's because the song was released on the soundtrack to Mercer's ole pal Zach Braff's 2014 film Wish I Was Here. Heartworms feels like a welcome return from an old friend, as Mercer & co. are still showing the kids how to do this heartfelt guitar-pop thing right. The Shins will be a part of the Firefly Festival in Dover, DE this June. **Donate $15 or more to Y-Not Radio this week to receive a download of Heartworms. Click here for details.